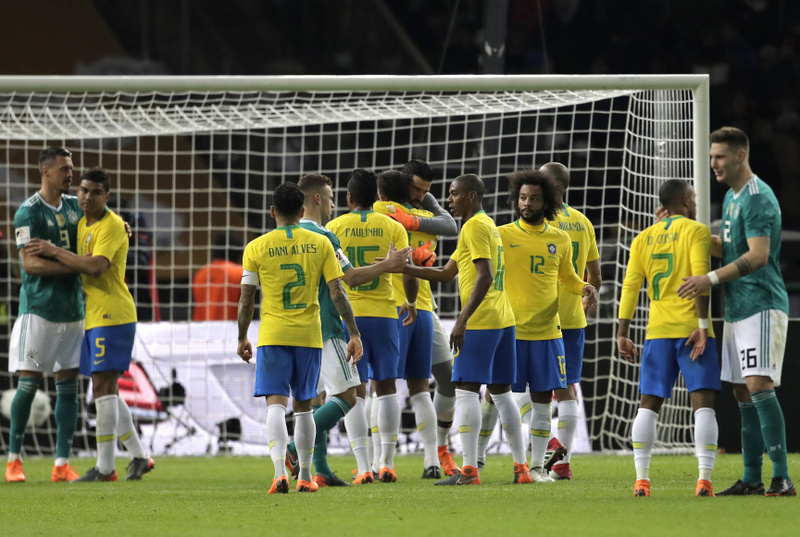 BERLIN (AP) — Brazil defeated Germany 1-0 on Tuesday to end the World Cup champion's 22-game unbeaten run and restore some lost pride following the humiliating mismatch between the sides in their previous meeting. Gabriel Jesus' first-half header settled the friendly and provided his side with a welcome confidence boost some three months before the World Cup. In the absence of the injured Neymar, Brazil didn't concede during the international break as it also defeated Russia 3-0 in Moscow. Though Brazil coach Tite said before the game in Berlin's Olympiastadion that revenge for the side's 7-1 loss in the 2014 World Cup semifinal was not in his players' minds, he acknowledged there was no getting over the result. "The wound is still open," Tite told Kicker magazine in an interview. "My wife started crying after the third goal." Counterpart Joachim Loew made seven changes from the side that drew 1-1 with Spain on Friday - the team's third consecutive draw - with Kevin Trapp playing in place of Marc-Andre ter Stegen in goal. Jerome Boateng led the side for the first time as captain in his hometown. Hertha Berlin defender Marvin Plattenhardt also started. Jesus made the breakthrough seven minutes before the interval when Trapp flapped at his powerful but centrally positioned header and allowed the ball go in. Willian's cross came in at pace and Jesus was just five meters from goal, but the goalkeeper was in position to make the save. Jesus had missed a good chance minutes earlier when he left two Germany defenders sprawling on a counterattack and then fired over with only the goalkeeper to beat. Ilkay Gundogan had the home side's best chance beforehand when he miss-hit the ball after Julian Draxler pulled it back. Referee Jonas Eriksson asked Brazil captain Dani Alves to calm his players down after Toni Kroos felt the effect of yet another robust challenge. Brazil emerged with more intent after the break, with Antonio Ruediger blocking Willian and Paulinho drawing a good save from Trapp off the rebound, before Coutinho fired just over. Joshua Kimmich produced a vital interception to deny Coutinho, and Jesus missed an open goal from the resultant corner. At the other end, Sandro Wagner twice headed good chances wide. It was as close as Germany got as Brazil adopted a 6-3-1 formation to protect its lead. "The body language was missing above all, the body language," said a disappointed Loew, whose side slumped to first defeat since losing to France in the 2016 European Championship semifinal. Kroos was scathing in his criticism of the side, which hasn't won since completing World Cup qualifying. "You saw that we're not as good as we're made out to be, or as some think we are. That was clearly too little from many (players) today," Kroos said. "There's huge room for improvement."